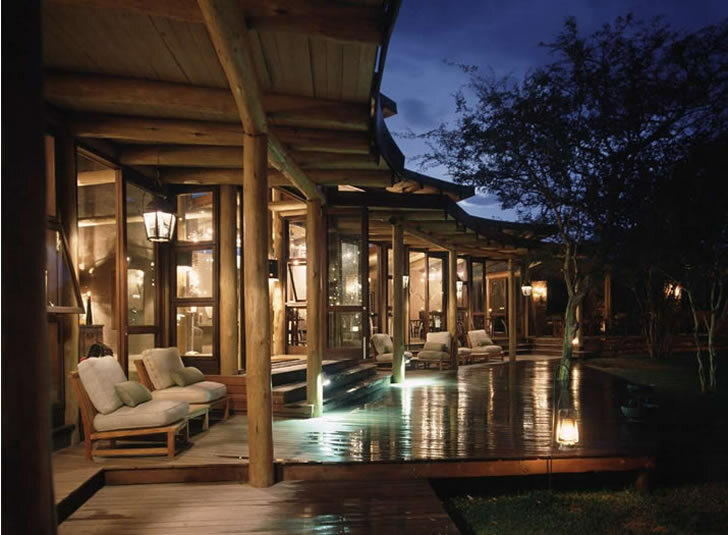 Privately owned by the Hunter family, Hunter�s Marataba is rich with allusions to an African past and invites guests on a journey of the imagination. Stonemasonry is evocative of a great, long-lost civilization, spears and prehistoric currencies reference ancient traders, and iron and bronze artefacts pay homage to the artistry of the continent�s craftspeople. 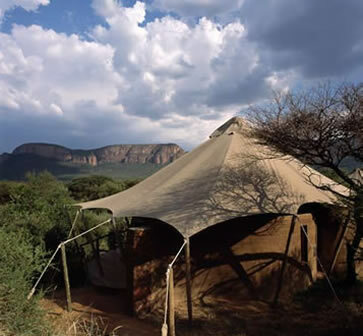 The Waterberg mountains unfold before visitors to Hunter�s Marataba like ancient monoliths deliberately placed to provide a majestic backdrop to the untamed elements. 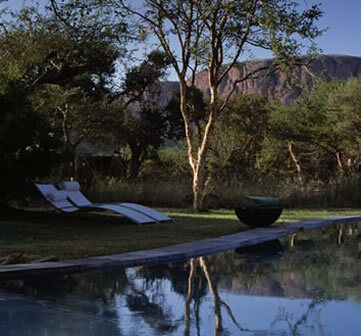 The lodge is located in the heart of the Limpopo�s Marakele National Park, an awe-inspiring landscape encompassing vast plains, dense bushveld, meandering rivers, deep gorges and towering rocky peaks. The area, in South Africa�s northernmost province, is steeped in legend and rich with tradition and culture, having once functioned as a gateway for trade between the people of what are now the countries of South Africa, Botswana, Zimbabwe and Mozambique. 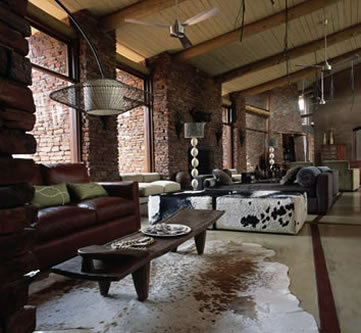 This legacy of convergence is at the heart of Marataba�s design vernacular, which comprises a meeting of ancient and contemporary African styles drawn from across the continent and expressed by a site-sensitive architectural composition of stone, glass and wood. 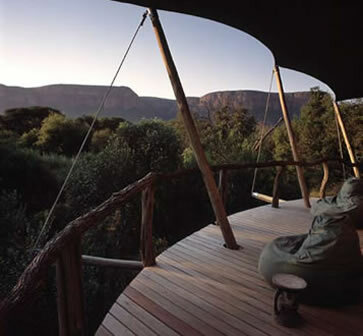 In designing Hunter�s Marataba, architect Nick Plewman was challenged not only by a relatively complex site featuring low trees and thorn scrub with an aspect to the northwestern end of the Waterberg mountains, but also a client brief underpinned by an historically inspired narrative. �The client�s account told of an explorer arriving at the site to find stone remnants from a previous ancient dwelling, onto which he grafted his own settlement,� explains Plewman. It was this fiction that led to the design outcome: thick stone walls cradle each of the 12 luxury tented suites and substantial stone buttresses support an otherwise seemingly weightless main lodge, which is characterised by lofty spaces and constructed of timber and glass. The buildings have been influenced as much by the client�s directive as they have by the beauty of the natural environment and the stone was forged locally to ensure it fully harmonises with the surroundings. Plewman�s purpose in laying out the main lodge was to embrace the magnificent views and the roofs have been pitched upwards to take in the mountain peaks and sky. Though relatively highrise, the height of these roofs was carefully calculated to remain within the tree line. As a result, the building is almost invisible until one is right in front of it. 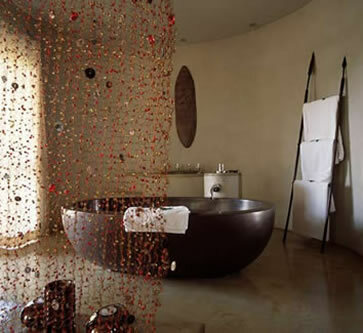 It is not only the extensive use of stone and glass that connects visitors to Marataba with the immediate environment, but also the various water features at its entrance, which serve as dramatic metaphors for Africa�s life force and induce a feeling of calm. One of the more striking spaces in the main lodge is the library, which is housed within a stone tower and also features panoramic views of the scenery. 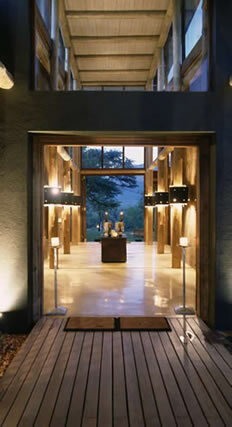 References to countries further afield have been integrated into the architecture, such as the carved Zanzibari doors and windows used in the reception and guest areas. 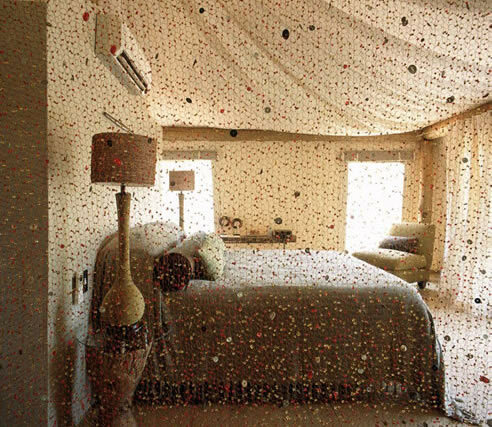 The mother-daughter interior design team of Jill and Jacqui Hunter added their own layers of history to develop the explorer/African trade route theme, creating a style described by Jacqui as �the ancient embracing the modern.� Low-level furnishings such as giant day beds, deep window seats, hammocks, oversized modular outdoor furniture, beanbags and bespoke long sofas and footstools set the inviting scene. The palette betrays the pair�s strong attraction to the all-pervasive natural beauty of the region; colours morph from the fresh green of new grass and soft greys of water to the purples and reds so characteristic of the Waterberg, though crisp watermelon is an undeniably contemporary addition. Bronze alludes to the past and serves to link the spaces. While surface interest abounds in the form of contrasting textures (cotton, velvet, linen and leather) and details such as beads, buttons, cocoabean chips and ostrich-egg shell, pattern is largely limited to what occurs in nature in the form of Nguni cowhides. 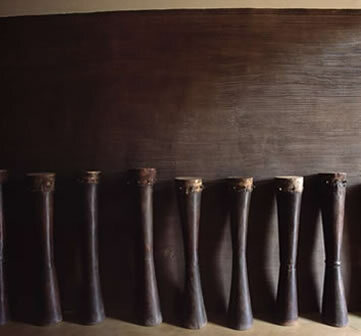 Local artisans have been widely employed in the creation of custom-designed pieces that range from bronze crocheted screens, lampshades and extraordinary beaded pendant lights to handmade crockery, wood and metal candlesticks, dining-room furniture (made of oak wine barrels) and handwoven bedspreads. In the process of developing Marataba�s unique visual idiom, the designers have also introduced items collected from every corner of Africa including Tonga doors from Zimbabwe (used as tabletops in the bedrooms), Ghanaian Ashanti stools, Dogon beds from Mali, carved Baule figures from the Ivory Coast, metal currencies that are decoratively displayed, and traditional spears that are installed above the beds as well as being inventively used as towel rails in the bathrooms. The overall effect, far from feeling contrived, is comfortable, authentic and irreproachably stylish.